That’s why I recommend relying on the ‘softer and closer approach (see the blog, “softer and closer approach”). However, no matter what discipline you attempt, it will all go to waste, and you’ll feel like banging your head against the wall, if you don’t have a healthy, positive, and pleasant relationship with your child. The key to parenting and discipline is you and your child doing things together, laughing and enjoying each other’s company, and spending time (quality and quantity time) in fun activities. Actually, even ‘not so fun’ activities can be quite bonding and reinforcing (e.g. helping with homework or school project, assisting in getting your child ready for bedtime…). 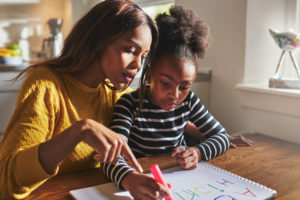 In any case, absent a healthy relationship, there is no glue to connect a parental directive to the subsequent (hopefully) compliant behavior. Kids comply because, ultimately, they love their parents, want their parents to be happy, want to get-along and have a good relationship, and realize that ‘we’re all in this together’ so I might as well do my part. If your child is complying predominately due to a fear of punishment, then you’re in trouble. In that case, your child’s ‘compliance’ is based in manipulation and fear, and tasks are often completed superficially and marginally.